C's grandma gave us the game "Ticket to Ride" today, and it is great fun! The turns go by really quickly, making for a quick game that is fast-paced enough to hold everyone's attention even when it isn't their turn. However, each player has 45 trains to keep track of, which can get a bit messy. 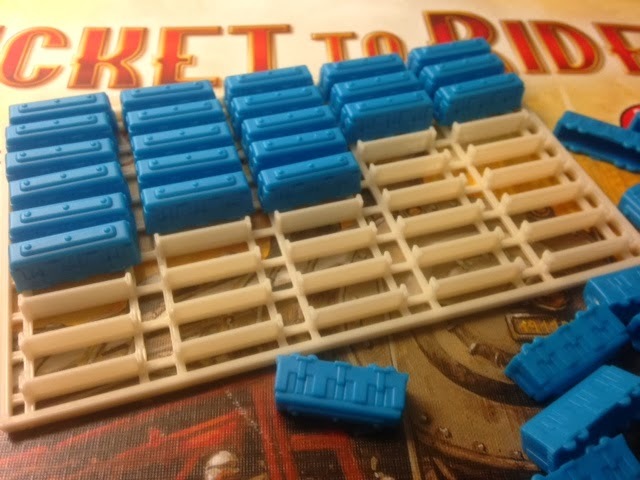 One of last year's Featured items on Thingiverse was a Ticket to Ride Locomotive Tray by princeofwands, which was updated and improved this year in HunterGreen's Ticket to Ride Rack design. However, both of those designs use a lot of plastic and take a long time to print. Today we designed a version in Tinkercad that uses far less material and prints in about half of the time, based loosely on the concept of our previous H-Tree Dish. Technical notes: Now that I'm learning to use OpenSCAD I am starting to feel that things like this are a real pain to make in Tinkercad, especially if a lot of tweaking and re-aligning is involved. It's a lot like the difference between using LaTeX or Microsoft Word; as a LaTeX junkie I am definitely feeling the current pulling me a little bit more towards OpenSCAD every day.